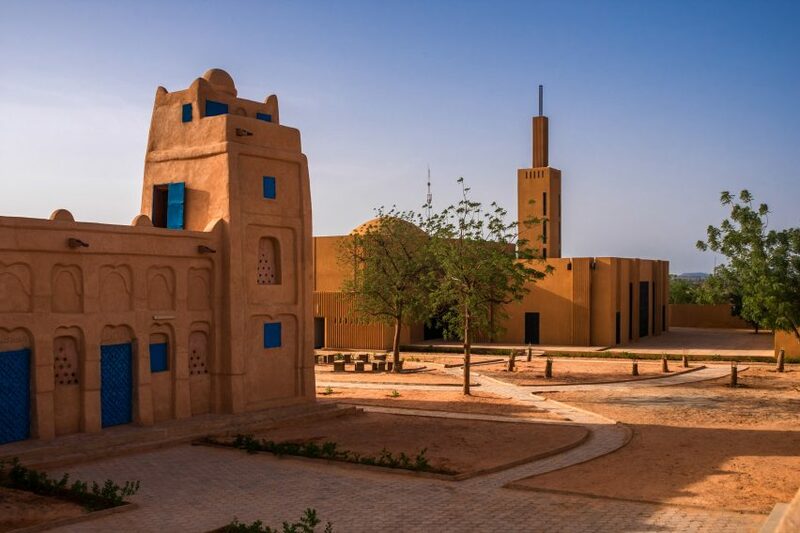 Niamey-based Atelier Masomi and Studio Chahar designed the library within the former mosque, which had fallen into disrepair and was no longer large enough to support the village's growing population, to save it from demolition. "I knew the mosque was something of a jewel. 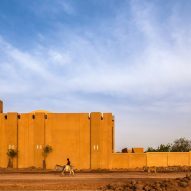 Both architecturally [and] because I found out that the mason who designed that mosque won an Aga Khan award for architecture for a very similar mosque," said Atelier Masomi founder Mariam Kamara. "We really wanted to bring it back to where it had been. Essentially the building was melting. It hadn't been maintained in more than 20 years. The facade had completely disappeared," continued Kamara. The mosque was transformed into a library at the suggestion of members of the community, with the original mason's assistant on the project enlisted to help with restoration of the facade of the old mosque. All of the facades have been rebuilt, as well as large sections of the roof and an upgrade of the internal structure. 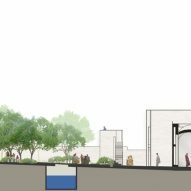 The library has been designed to interact with the new mosque, also designed by Atelier Masomi, with both buildings on the same north-south axis. The library's primary entrance, located to the south, faces the mosque's primary entrance, located on its north-facing facade. "We wanted to enable a dialogue and also to dramatise something that we feel is going on throughout the whole world between religious and secular knowledge," said Kamara. "You know, the fact that there is a feeling that the two cannot coexist in the same space." Kamara collaborated with Iranian architect Yasaman Esmaili, founder of Studio Chahar, on the Dandaji project. "We both come from Muslim countries, so it this whole dialogue between Islam and secular knowledge was really interesting for us," said Kamara. "One of the most important things in Islam is the pursuit of knowledge. It's actually a requirement and yet it is never talked about. 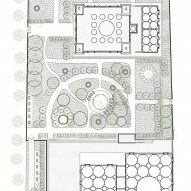 We approached the project from that point of view." "We tried to establish a link through landscape design, so the paths lead from one to the other rather naturally," Kamara told Dezeen. "The facades also face each other. You can be in the library and then when it's prayer time you just walk on this convenient path that takes you straight into the mosque." "It was just simple things like that," said Kamara. "It didn't need any big gesture connecting the two. It was about ritual and habit." 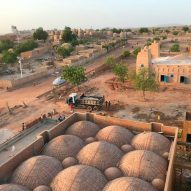 The new mosque was built using locally fabricated compressed earth bricks, which require very little maintenance compared to the adobe of the existing building. The compressed earth bricks share many of the thermal qualities of mud bricks, with none of the maintenance. The thermal mass of the compressed earth bricks and integrated natural ventilation through openings regulates the interior temperatures and removes the necessity for mechanised ventilation. 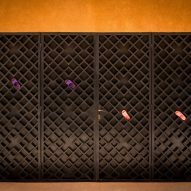 "The material itself represents the position that we are taking on the materials that we should be using in these kinds of climates, as opposed to just accepting that cement bricks are the rule of the day," Kamara said. "It is a cheaper material; it's more adapted to the climate. It was just kind of a no-brainer." Earlier this year Kamara was selected by David Adjaye as his protege for the Rolex Art Initiative. 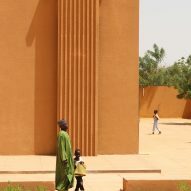 In January, the two of them will visit Niamey to conduct a series of workshops to determine the direction for a community centre in the capital city that will be designed by Kamara under Adjaye's guidance. "We want to find out about what people want that we didn't anticipate, or think of things that your average cultural centre wouldn't even have. 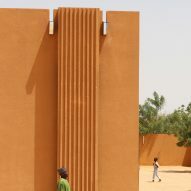 In the work that I am trying to make, the most important thing is talking to the people using those spaces," said Kamara. "Otherwise it is just us as architects saying 'here, this is what I think you should be doing and this is what I'm going to give you. There you go, you're welcome.' That is something that's very unpleasant for me. We are not making architecture for ourselves, so it would be preposterous to just decided on something and go ahead and do it."